In the past, there is no way for you to directly upload HEVC video to YouTube since YouTube excludes HEVC codec from YouTube supported file format list. Thankfully, things are different nowadays. 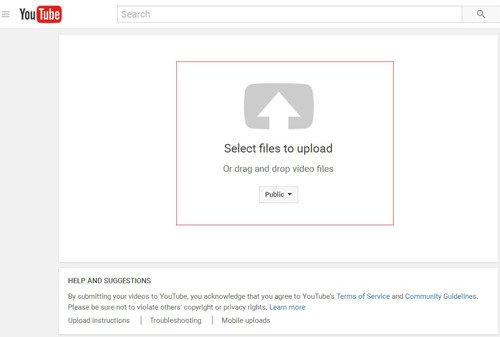 YouTube eventually accepts HEVC/H265 video uploading. That's really a piece of good news. You can finally share HEVC/H265 video to YouTube without conversion. Yet, how to post H265 (HEVC) videos clips footages to YouTube? Follow the below user guide to put x265 video (8/10/12 bit) to YouTube step by step regardless of 1080p HEVC or 4K HEVC. You can directly post hevc video to YouTube app on your iPhone X/8/7/Plus Android device or transfer HEVC video from iPhone Android to computer. Multiple options are available for you to sync hevc from mobile device to computer, like mobile transfer software, E-mail, iPhoto, Image Capture, USB cable, Micro SD card, etc. Afterwards, you're allowed to begin hevc to YouTube sharing process. Step 1: Visit YouTube website and sign into your YouTube account. Hit "Upload" icon on the top right corner. Step 2: Click "Select files to upload" button to choose your desired HEVC video from your computer. Step 3: Edit video basic information for your video (e.g. Title, Description, tag, privacy or public, etc). You can also adjust the advanced video settings. Step 4: Press the "Publish" button to finish the process. 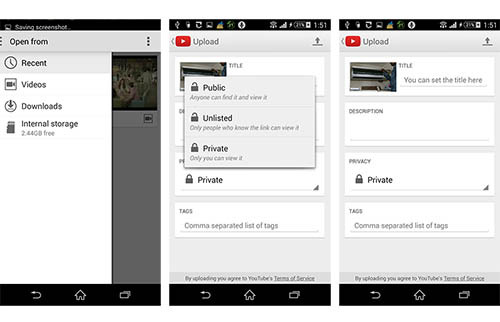 After your video is uploaded, you can inform your friends or family to watch those wonderful HD/UHD videos on YouTube. Step 1: Turn on Wi-Fi network connection on your Android device. Step 2: Launch YouTube App and select the Gallery app on Apps Menu screen. Step 3: Play the HEVC video you wanna upload and tap "Share" button. Then choose "YouTube" from the pop-up menu. Step 4: Give the HEVC video a title, a description from "More Details" option and decide whether it's private or public. More settings are also available. Step 5: Tap "Upload" button and then leave the rest to your YouTube app. It will continue uploading HEVC even though your device falls asleep. If you are an iOS user who is prone to post hevc x265 video to YouTube from iPhone iPad, please refer to YouTube upload instruction from Google Support. Why YouTube Recommends H264 Codec Not HEVC? YouTube indeed supports HEVC x265 video uploading, but on official Google Support site we find that YouTube recommends H264 as the best video codec. Why? H265 has any disadvantage when it comes to compare H265 with H264? Which one should you choose? Calm down! Let us explain to you one by one. Afterwards, you could understand why YouTube recommends H264 instead of H265. Of course, suit yourself if you still prefer HEVC to H264. 1. HEVC (H265) codec is patented by a good number of parties and charged in higher licensing fees. So many platforms don't accept HEVC codec now. 2. HEVC indeed produces better video quality at lower space and bandwidth consumption. But it is much higher demanding than H264 in computing power, almost 10X more power needed. 3. Compared with H264, H265/HEVC has far higher requirements on hardware configurations (CPU, GPU & RAM), software (HEVC x265 player) and operating system (Win 10/macOS High Sierra/iOS 11/latest Android OS) to decode and play HEVC video. To sum up, the compatibility of HEVC needs to be improved. Currently the number of YouTube viewers whose hardware and software both support H265 HEVC video playback is quite limited. If you post HEVC video clips to YouTube, there is high likelihood that a large number of YouTube fans can't successfully watch your HEVC YouTube video because of their unqualified hardware configurations, software or OS. If your video is unaccessible to YouTube users, what's the point of putinging hevc to YouTube? So to make your HEVC video be viewed by as many as YouTube fans, you're strongly suggested by the YouTubers who are thriving to convert H265 to H264 and then post H264 video to YouTube. Thus, almost anyone can enjoy your YouTube video online or offline on any iPhone iPad Android or computer without any annoying requirements on your hardware device or software (HEVC player). * Convert H265/HEVC video to H264 formatted by MP4, FLV, AVI, MOV, WMV, WebM, etc YouTube supported video container format. * Compress HEVC 4K to H264 1080p or 720p HD with smaller size for faster process. * Trim and shorten HEVC video length within 15 minutes; crop and remove HEVC video black borders; rotate HEVC video and add subtitles to HEVC. * Change HEVC frame rate ranging from 24fps to 60fps and adjust SDR/HDR HEVC video bit rate up to 85 Mbps. * Free download HEVC video movie from YouTube, Vimeo, Dailymotion, extramovies, moviefone, etc. 300+ video sites. In order to smoothly share HEVC to YouTube, you ought to finish the task of HEVC to H264 transcoding first. Now, download this HEVC video converter on your Mac (macOS High Sierra) or download Windows version (Win 10/8/7 supported) if needed. Next, follow the below guide. Open up this H.265 converter on your computer and click "+ Video" icon to load HEVC video that you desire to put to YouTube. Or simply drag and drop HEVC video files to the main interface. Batch conversion is supported. Click "YouTube Video" to choose your desired MP4 (H264) as output YouTube video format. BTW, YouTube fully supports MOV, FLV, WebM and other video formats encoded with MPEG-4, H.263, etc. Hit "Browse" button to select a destination folder to save the converted video and tap "RUN" button to start converting HEVC to MP4, MOV, WebM, MKV, etc. in H264 codec. Known as H.265 and MPEG-H Part 2, HEVC (High Efficiency Video Coding) is a video compression standard rather than a video format. In the comparison between HEVC/H.265 and H.264, it is not hard to find that H.265 offers much higher image quality at the same bit rate and it supports resolution from 260p up to 8K UHD(8192×4320). 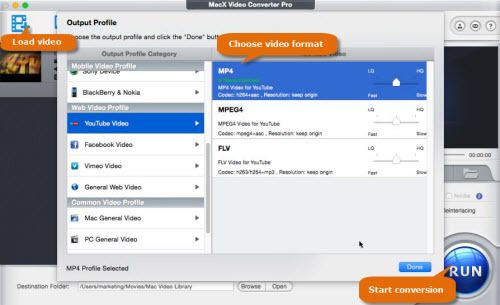 Free download MacX HEVC video converter to easily convert HEVC to YouTube recommended best codec H264 (formatted by MP4, MOV, MKV, etc.) and compress HEVC 4K to H264 1080p/720p HD for faster posting on PC/macOS. Also enable you to free download HEVC video from 300+ sites.